The audio originally aired on CKUT's Off the Hour on Tuesday, December 25th, 17h-18h. 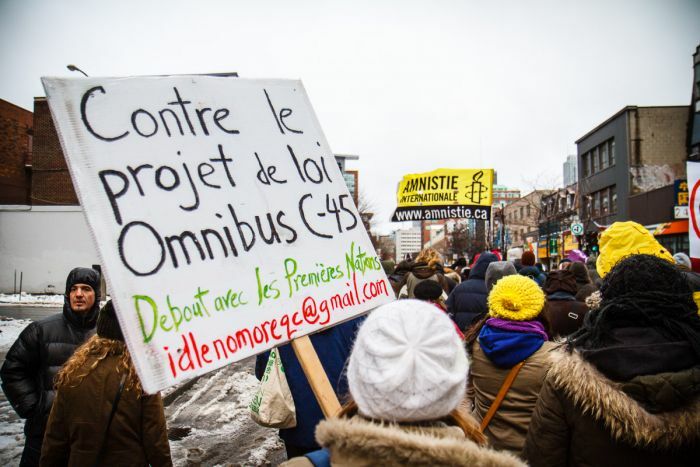 In Montréal, activists don’t tend to be idle for long. So it was surprising when, as the Idle No More movement spread across Canada, Québec stayed silent for almost two weeks. Finally, last Friday, December 21st, hundreds of First Nations and supporters spilled into the streets of Montréal, in Québec’s second Idle No More rally, following a demonstration the day before in the nearby reserve town of Kahnawake. 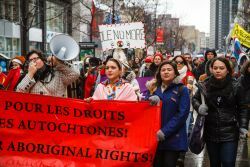 “It was a movement that came from the West; everything was in English at first, so it took a little time for people to acknowledge it,” said Odile Joannette, who is the co-president of the Montréal Aboriginal Network and was a participant in the Montréal protest. Chief Theresa Spence, while absent from the march, was nonetheless ubiquitous there. 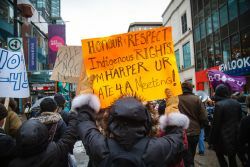 Many of the protesters invoked her hunger strike and undying resolve as a driving force behind the Idle No More movement. 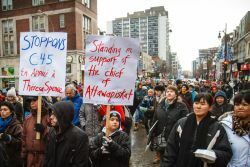 The Attawapiskat chief began her hunger strike December 11th, calling for a meeting between Prime Minister Stephen Harper, Governor General David Johnston, and aboriginal leaders. Stephen Harper has yet to respond to the demand. 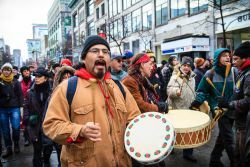 The Idle No More movement was conceived in opposition to the Conservative government’s budget bill, also known as Bill C-45. 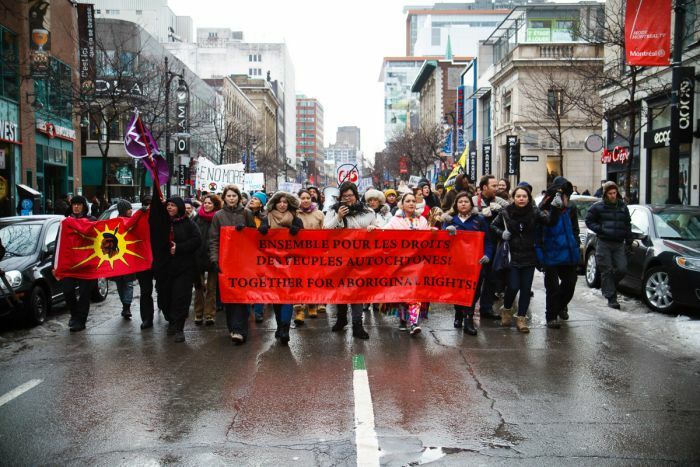 Notably, the bill enacts changes to the definition of Aboriginal fishery and to the Indian Act. 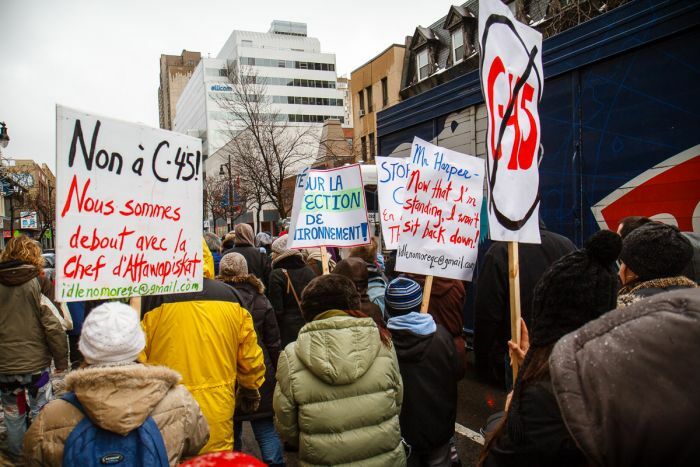 The changes were imposed unilaterally with no consultation of native groups. 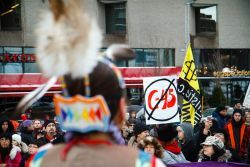 The bill’s modifications to the Indian Act change the system of voting in native communities so that only a portion of the eligible voting members of a band would be able to make a decision on whether or not to lease reserve land. The Navigable Waters Act is also amended under Bill C-45, reducing the number of federally protected waterways to 162. 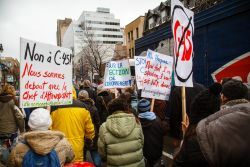 The move effectively designates the vast majority of Canadian bodies of water as “unprotected” and therefore susceptible to unregulated development, leaving the path wide open for pipeline construction. 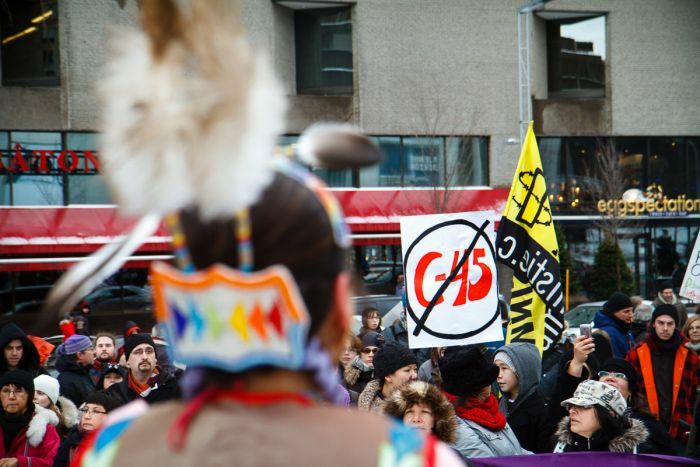 Sylvia McAdam is one of four women from Saskatchewan who initiated mobilization against Bill C-45 and thereby sparked the Idle No More movement. 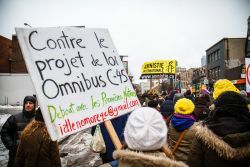 “[Bill C-45] is a direct attack on First Nations lands and on the bodies of water we all share from across this country," she said. Despite mobilization against it, the bill was passed into law on December 14th. 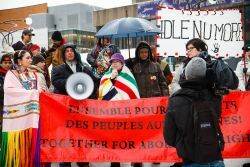 However, since the passage of the bill, the movement has taken off, attracting attention and solidarity marches across the globe. 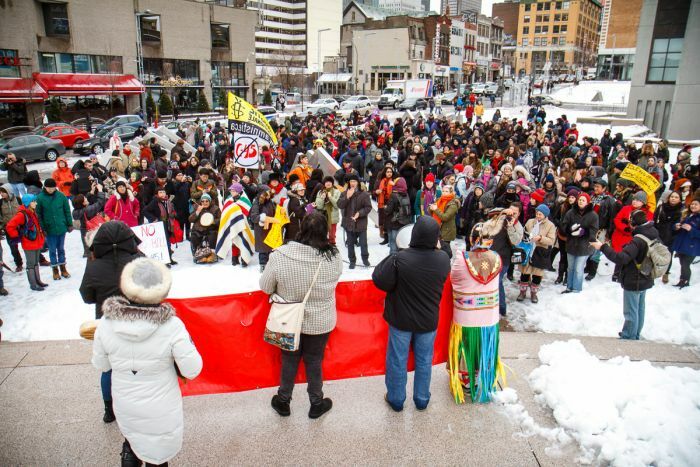 Idle No More and Chief Spence’s hunger strike have been widely endorsed nationwide, gaining traction in particular on Twitter under the hashtag #idlenomore. 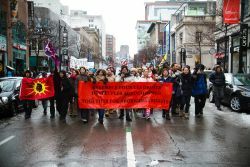 In Regina and Saskatoon on Boxing Day, Idle No More activists gathered in the form of flash mobs at popular shopping centers to draw the attention of the hordes of customers and spread awareness about the movement. 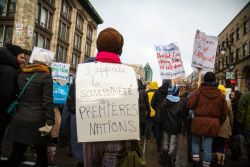 In Montréal last Friday, the march ended at the Place des Spectacles, where organizers led protesters in a traditional round dance, in solidarity with the other Idle No More demonstrations that were happening simultaneously across the country as part of the day of action. Well-meaning participants bumbled in interlocking circles, winding chaotically around the square as they tried to keep up with the beat. 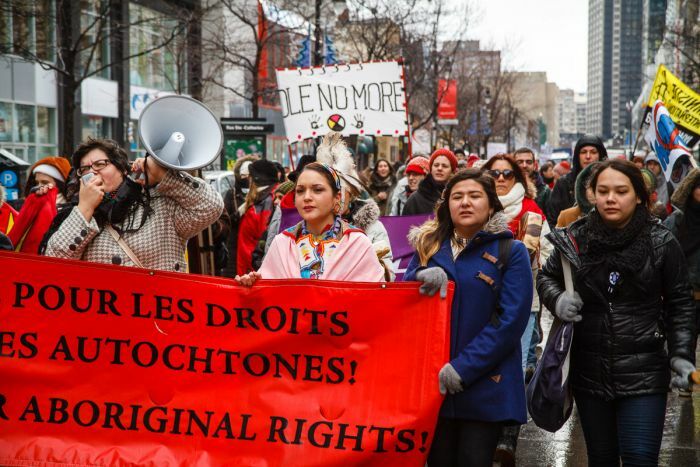 “This is a little bit of a mess,” said Marie-Céline Charron, a traditional dancer from the Naskapis nation and one of the co-organizers of the Montréal protest. 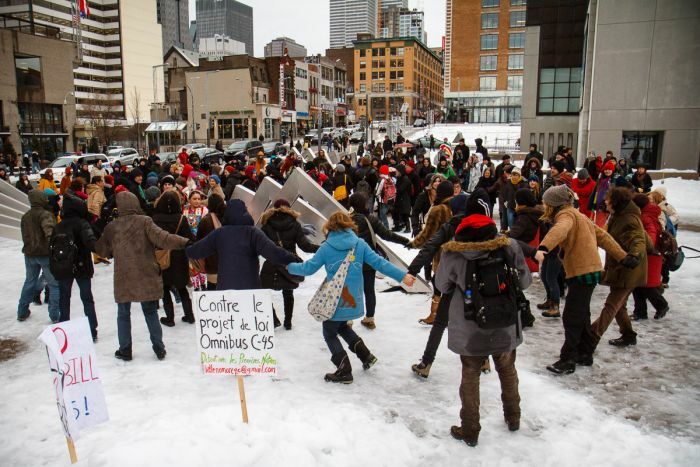 She smiled good-naturedly as she attempted to tame the mass of protesters into a cohesive round dance. But the dance ended in widespread grins and applause amid the snow and freezing rain. 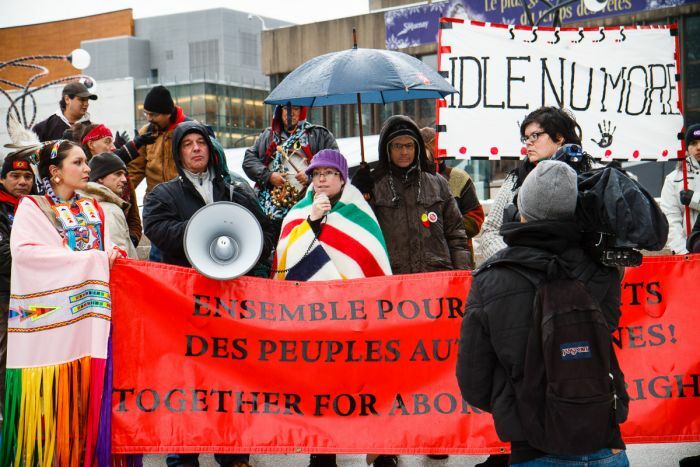 For their part, Montréalers seemed overjoyed that the Idle No More movement had finally arrived.